Home > We’re Getting a Puppy! After 9 years of spoiling our two cats rotten, the time has come to bring a new pet into our home. This fall, we’ll be bringing home a Hungarian Vizsla puppy to join our family. Although this event has been 2 years in the making, it’s only been a few months that we’ve been sharing this news with friends family and on social media. I thought it was time to put together post and FAQ to answer some of the most commonly asked questions. When Did You Decide to Get a Puppy? About 2 years ago, Jess started to talk seriously about wanting to get a dog. 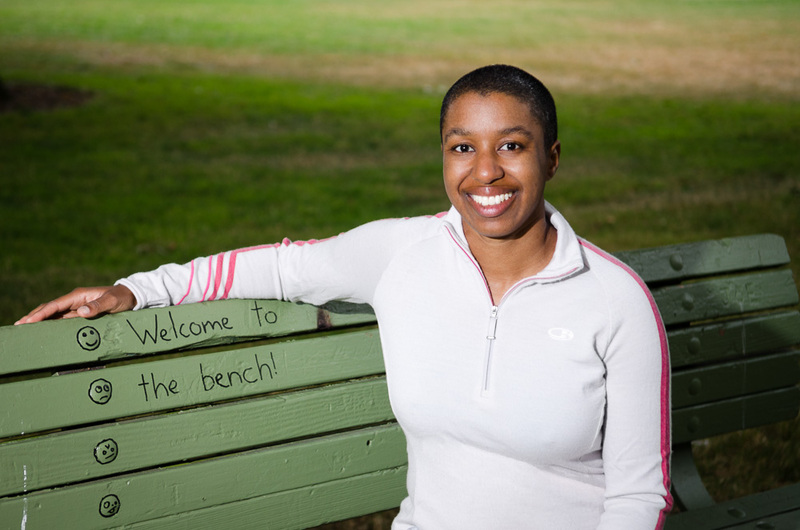 We both love dogs and had dogs around as kids–though my experience was with my parent’s German Shepherd as a toddler and some ill-fated pups who ended up getting stolen or running away as a pre-teen. I’ve wanted a dog my whole life, but I never wanted to be a person who owned a dog and didn’t have the time, energy and money necessary to give it a great life. Now, since I work for myself and have a great dog-friendly co-working space, and Jess only works 3 days a week, the timing is perfect. So I said yes. About 6 months passed, during which Jess went into research mode. After a thorough investigation into a lot of different breeds and options, she announced that she wanted us to get a Vizsla. 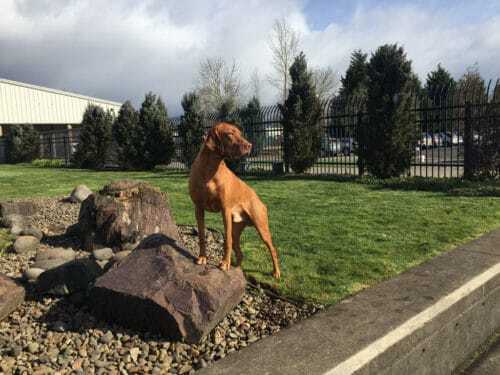 I was vaguely familiar with Vizslas and the more I found out, the more I liked. They have incredibly sweet personalities. They are often referred to as ‘Velcro Vizslas’ because of how much they LOVE being with people. And lots more. Or they can just be your best hiking, camping, mountain biking, paddle boarding, couch potato buddy. Vizslas don’t have a dog smell. This is a lottery win for Jess, who is extra sensitive to smells and will often notice odors I’m oblivious to. They have super short coats and are very low maintenance in the grooming department. A bath a month at most, but most of the time you can just rub them down with a towel and go on with your day. The next step was to figure out where to get one. As Jess began looking into this, we quickly found out that dog people, in general, seem to be stuck in the early 90’s when it comes to the internet. Websites are almost universally terrible, or non-existent and it’s really challenging to find information online. When we did reach out to people, responses were spotty at best. Eventually, we found out that one of the major dog shows happens just 10 minutes from our house and is free to attend as a spectator. Everything I knew about dog shows up until that point, I had learned from the movie Best in Show. As we approached the entrance, I steeled myself and prepared to encounter an entire exhibit hall of adorable dogs that I might not be able to pet. It’s hard enough for me to leave service dogs alone when I encounter them, so I seriously didn’t know how I was going to cope. As we walked around, checking out all the different breeds, I couldn’t believe that there were events where all the cutest specimens of just about every breed of dog regularly gather and I had reached my 40’s without ever going to one. What had I been doing with my life? Things were going well in the restraint department until I spotted a row of giant portable crates with Great Dane heads sticking out of them. I approached a man standing next to one of the crates and asked if I could say hello. He was super friendly and chill and only too happy to let us pet his dogs while he told us about them. And in fact, most of the people we met were quite open to dog greeting, provided they weren’t about to go into the ring. I stuck to asking to meet short haired dogs. There was some serious fluffing going on in some areas and asking to touch those dogs after the obvious effort of getting them to look perfect, seemed about as wise as asking a Black woman if you can touch her hair. We finally made our way to where the Vizslas were showing. We met and talked to a breeder there who was clearly very serious and probably came closest to matching my preconceived Best in Show notions. She made it quite clear that her dogs were SHOW DOGS and anyone she sent them home with had better be willing to show them. Clearly, she wasn’t the one for us, but over the next year, we went to more shows and started meeting folks who were better matches for us. (SIDE NOTE: If you haven’t seen a Pomeranian run a dog agility course, get yourself over to YouTube as soon as you finish reading this. 🐶😂). We ended up finding a few different breeders with litters planned in the near future who were a much better match for us. 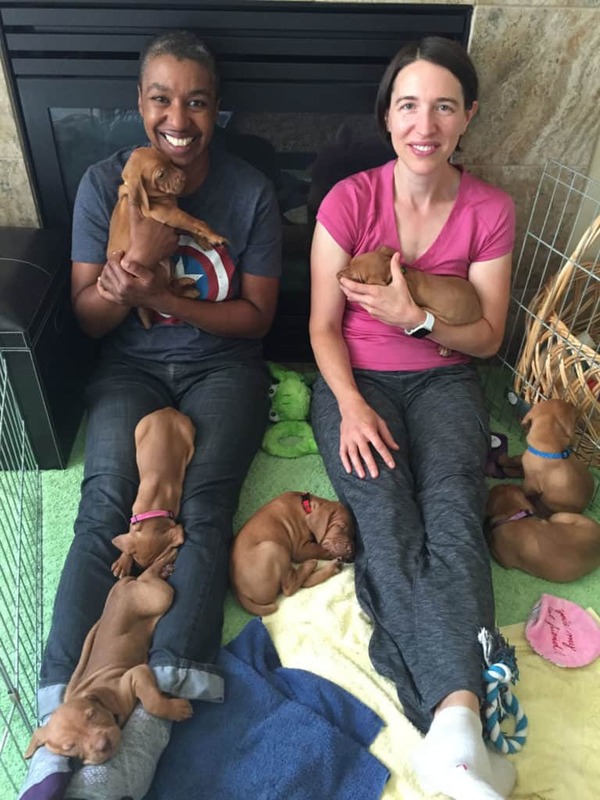 In fact, we soon realized that we had entered a small Vizsla community where everyone knew each other and felt like a little family. Eventually, we narrowed the list to three people who were planning to have litters in the next few months. The first litter was born in November 2017 and although we weren’t yet ready to take a puppy home, Eleesa was kind enough to let us come and visit the 7-week old litter. Being in a puppy pile was on my bucket list and I can confirm that it definitely lives up to the hype. 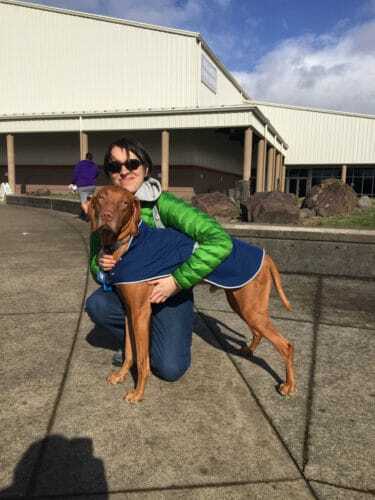 Over the winter and spring, we went to more dog shows and spent a lot of time talking with Carla from Sokoldalu Vizsla’s. She was endlessly patient with our questions and very experienced and knowledgeable. 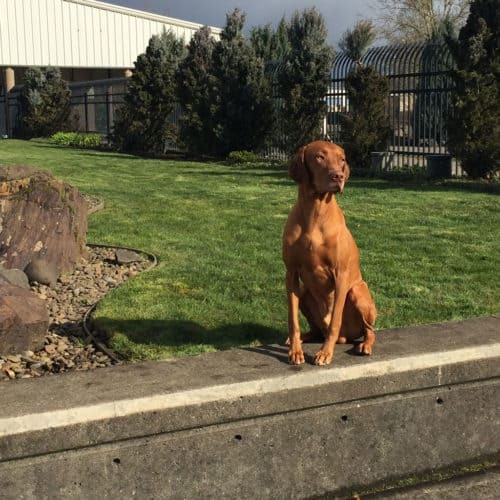 We loved that she breeds her dogs for trainability and encourages families to do many different things like hunting, agility, Rally obedience, and not just conformation shows. We met Brock and Sola, the dogs she was planning to breed, and fell in love with them both. Brock giving Carla a hug. Brock is a particularly dangerous charmer and there are at least a couple of people going home with a puppy they weren’t planning on after meeting and falling for him. We asked Carla to officially put us on the list to bring home a Brock x Sola puppy and she accepted. She sent us a giant questionnaire to fill out about our home, lifestyle and desired activities. This is so she can make sure every family gets a dog that is well-suited to their lifestyle. Which Puppy Are You Getting? 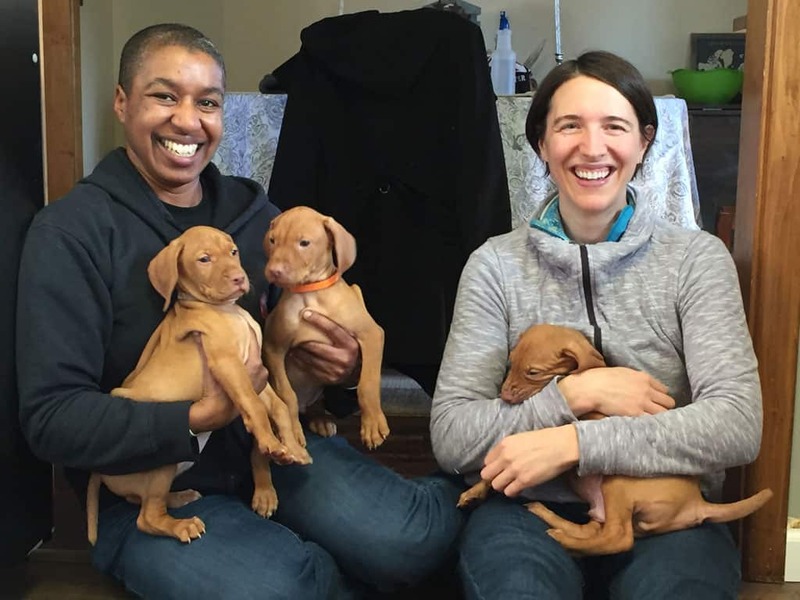 One thing we learned is that with reputable breeders the puppies get a temperament test at 7 weeks and structural evaluation at 8 weeks of age and that helps determine their future home. If you want to do intense dog sports like agility or hunting, then you need a dog that is physically sound enough to be a high-performance athlete. For that reason, we won’t know which puppy is ours until this testing is done. We should find out which puppy is ours around September 19th, 2018. Are You Getting a Boy or a Girl? We’re not picky and we didn’t want to lower our chances by restricting our choice to one gender. Though we have a slight preference for a boy, we’ll love whatever we get! 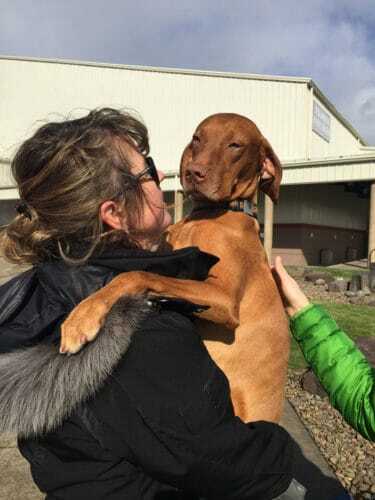 We have yet to meet a Vizsla we didn’t love. When Are You Bringing Your Puppy Home? Sola gave birth July 22nd, 2018 to a litter of 4 girls and 3 boys. The puppies are old enough to come home at 8 weeks of age. A few of the puppies had a small health issue and will have to wait a couple of extra weeks to go to their home. We won’t know our go home date until we find out which puppy is ours. We’ll get our puppy either September 23rd for Jess’s birthday or the weekend of October 5th. It’s pretty torturous not knowing the date, but hey, people go through this with human babies all the time. We were lucky enough to be able to drive up to Washington and visit the litter when the puppies were just under 4 weeks old. If you thought a pile 7-week old puppies was good, a pile of 4-week old puppies is literally magical. Puppy breath is totally a thing! Covered in 4-week old puppies! Best. Day. Ever. That’s not a question, but it’s definitely an opinion held by many people. I loooove all dogs and I’m all for rescuing a puppy or older dog if that’s what YOU want to do. 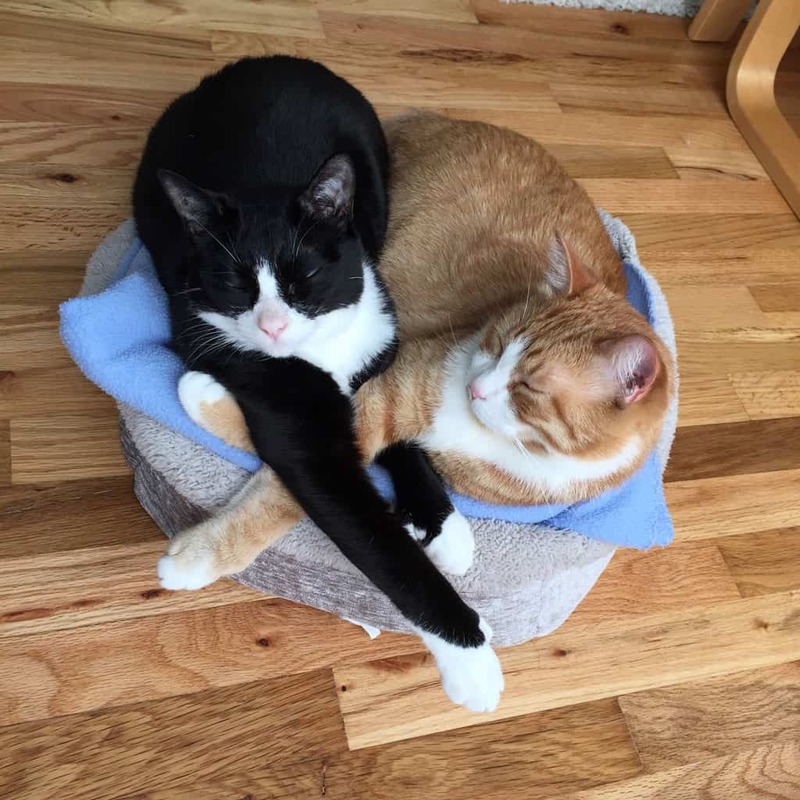 We rescued Oz and Xander, our spoiled cats from the shelter and we love them to death. Committing to a dog can be a 10-15 year or more commitment and isn’t something we’re entering into lightly. This has been a two-year project to make sure we’re making the best decision and creating an environment for our new dog to thrive. There are tons of shelter dogs who get there because they’re returned by people who got a dog on a whim and then changed their minds. A responsible breeder will stay involved for the life of their dog and take it back if for some reason you become unable to care for it. I’m a big believer in minding your own business when it comes to telling people how to grow their family. If you wouldn’t walk up to a pregnant woman and tell her she should have adopted, don’t tell people where to get their pet. (And if you would do that, I definitely don’t want to know you). They’re gonna be pissed. Unfortunately, we weren’t aware of the need to socialize our kittens when we got them and they grew up kinda sheltered, thanks to Willow, my cranky old lady cat who hated them on sight. The boys are sweet-natured though, and we’re hopeful that once they realize this new red zooming furball isn’t going away, they’ll take steps to let him or her know who’s in charge and establish a good relationship. We did write some ‘love letters’ by taking a towel the cats had been sleeping on to the puppies and taking a puppy scented towel back to our cats, which was a big hit with all involved. What Are You Going to Name Your Puppy? Jess is in charge of naming the puppy. When we got our kittens, she was supposed to get to name one of them, but I talked her into letting me name Oz in order to keep my Buffy the Vampire Slayer theme going. Jess isn’t a fan of most fantasy shows so she’s been a little salty about it ever since. I did recently get to see the short list of names and they’re great. Carla themes each litter, and our litter theme is ‘Written in the Stars,’ so the puppy might have some celestial-related name, but that’s all I can tell you. All will be revealed when we bring the puppy home. Can I Meet Your Puppy? If you’re a friend or family member reading this and need more puppy in your life, great! Our puppy needs to meet 100 people of all ages and types in the first month! But we won’t be able to venture out with the puppy until it’s about 4 months old and has all its shots. So if you’d like to come to our house and help socialize and train, contact me and I’ll let you know when we’re accepting visitors. Men and children are especially welcome! We do plan to be pretty serious about training our puppy to be a good citizen, so you might be required to hold back your love until the puppy is behaving well (sitting for pets, no jumping etc). If you’re willing to wear your funniest hat, walk your dog in front of our house, or be a ‘ringer’ for doorbell training, even better. What Sort of Training Are You Going to Do? In addition to the usual obedience and good citizen stuff, we’re hoping to get into agility and maybe some other dog sports when the puppy is mature enough. We like to hike, bike and paddle board so we’ll be priming it for adventure by introducing those things early. 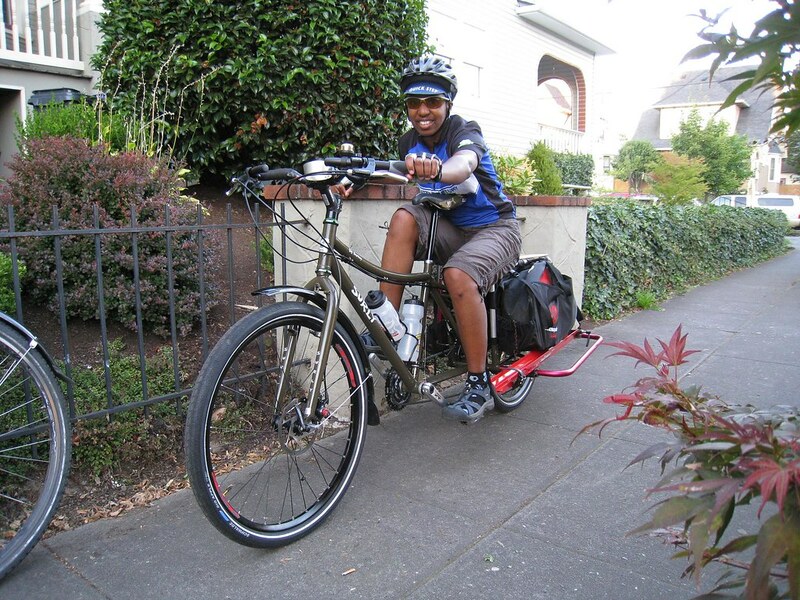 I also have a Big Dummy cargo bike and I’ll be getting a sidecar for it so the puppy can ride around town in style. No sticking the head out the window needed! (Which isn’t safe anyway). We’re big fans of positive training, so whatever we teach our pup, we’ll make sure it’s fun. We love books by Ian Dunbar’s books and I’ve been binge-watching Zak George puppy training videos on YouTube as well as reading his Dog Training Revolution book. We’ll most likely be attending at least one puppy class at Wonder Puppy as well. We are beyond excited to embark on this new phase of pet momhood and look forward to all the new adventures that await. If you want to follow along, following me on Instagram is your best bet. Oh boy, are you in for some happy times! I am now 71 years old and on my second Vizsla. I love them. Piper was sweet and mischievious and funny; Jo is so good, biddable, and sweet. One of the luckiest happenstances in my life was a neighbor bringing home a Vizska puppy, which started the love affair, and deciding to get my own V was one of the best decisions I ever made. Thanks Carolyn! We’re pretty thrilled and looking forward to many adventures.